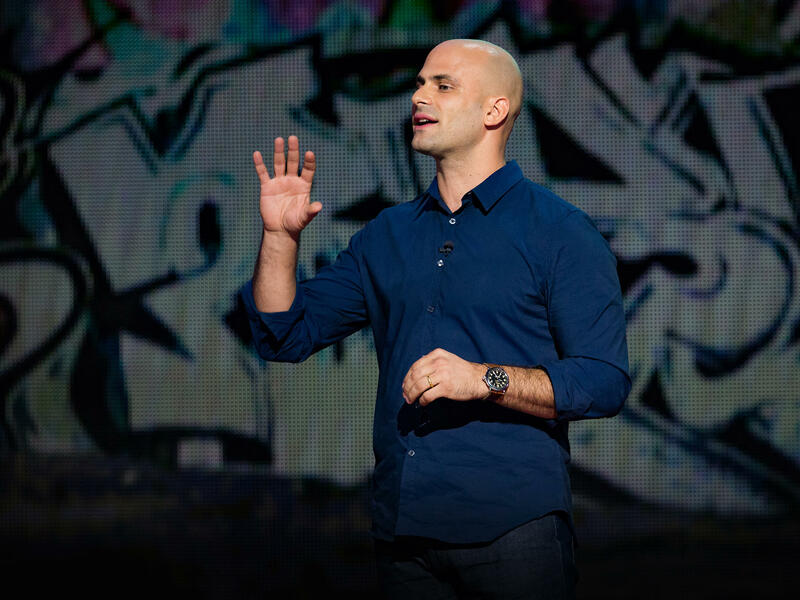 Sam Kass speaks at TED Talks Live - Education Revolution. 16 million children face hunger in the U.S., which can prevent them from performing well in school. Chef Sam Kass describes a simple solution with a potentially huge impact: free breakfast. Sam Kass is a former White House chef and food policy advisor for the Obama administration. He was also Executive Director of First Lady Michelle Obama's "Let's Move!" campaign. As one of the First Lady's longest-serving advisors, he helped create the first large-scale vegetable garden at the White House since Eleanor Roosevelt's victory garden. He also helped advise on an initiative that provided free breakfast to all students at low-income schools. He is the founder of TROVE and a partner in Acre Venture Partners. It's the TED Radio Hour from NPR. I'm Guy Raz. And on the show today, ideas about simple solutions to complex problems, like getting kids to do better at school. RAZ: It's one of those challenges that virtually every city in every country faces. Some kids do well and lots of kids just struggle, and there's no shortage of experts and analysts and policymakers and consultants who spend a lot of time trying to figure out how to solve this so-called achievement gap. But it turns out there may be one solution that's pretty simple - food. RAZ: This is Sam Kass. He's a chef. KASS: And I'm the former senior policy adviser for nutrition and the executive director of Let's Move! in the Obama administration. RAZ: And Sam's simple idea is that if schools could provide every kid with enough nutritious food, well, those kids would obviously be healthier, but their brains would also be more attuned to learn. Here's Sam on the TED stage. KASS: What do we think the connection is between a child's growing mind to their growing body? What can we expect our kids to learn if their diets are full of sugar and empty of nutrients? What can they possibly learn if their bodies are literally going hungry? And with all the resources that we are pouring into schools, we should stop and ask ourselves, are we really setting our kids up for success? Food is that place where our collective efforts can have the greatest impact. Let me give you two stats that seem like they're on opposite ends of the issue but are actually two sides of the same coin. On the one hand, 1 in 6 Americans face hunger every year, including 16 million children - almost 20 percent. In this city alone, in New York City, 474,000 kids under the age of 18 face hunger every year. On the other hand, diet and nutrition is the No. 1 cause of preventable death and disease in this country by far, and fully, a third of the kids that we've been talking about tonight are on track to have diabetes in their lifetime. Now, what's hard to put together but is true is that many times these are the same children. So they fill up on unhealthy and cheap calories that surround them in their communities and that their families can afford, but then by the end of the month, food stamps run out or hours get cut at work, and they don't have the money to cover the basic cost of food. KASS: Just think about how hungry a young person is because they're growing, right? They're expending so much energy because they're growing and they're learning and their brains are taking in a lot of information, and we're asking a lot of them. There's no way that a kid can learn if they haven't gotten basic nutrition because if you're sitting there and you haven't eaten all weekend, for example, and you show up to school and literally you're experiencing hunger pains or you haven't eaten since lunch the last day - because a lot of kids go home and there's no food in the house - you're not going to be able to do a math problem. So I think it's one of those starting points that we have to take care of their basic well-being before we can expect them to excel in the classroom. RAZ: So when you were in the Obama White House, were you guys able to make changes to solve some of those problems? KASS: Yeah. And so one of the changes that we made was called the Community Eligibility Program, which allowed schools that had significant populations of low-income children to serve breakfast to everybody. KASS: As part of my work in the White House, we instituted a program that for all schools that had 40 percent more low-income kids, we could serve breakfast and lunch to every kid in that school for free. This program has been incredibly successful because it helped us overcome a very difficult barrier when it came to getting kids a nutritious breakfast. And that was the barrier of stigma. See, schools served breakfast before class, before school, and it was only available for the poor kids, so everybody knew who was poor and who needed government help. Now, all kids, no matter how much or how little their parents make, they have a lot of pride. So what happened? Well, the schools that have implemented this program, they saw an increase in math and reading scores by 17.5 percent. And research shows that when kids have a consistent nutritious breakfast, chances of graduating increased by 20 percent - 20 percent. When we give our kids the nourishment they need, we give them the chance to thrive. RAZ: It's amazing that you change just this one thing - free breakfast - and it has this enormous impact on, like, health and educational outcomes. KASS: Absolutely. Test scores tell you a very clear story. And it's - this is nothing that - this is common sense. We can all just test ourselves. Go two days without eating much, or just eat a few bags of chips and then go take some kind of test. KASS: And see how you do. I guarantee you you're not going to do that well. Kids make many more mistakes. Their cognitive ability slows down. And on the flip side, when they get the nourishment, they are much more proficient in solving problems, in comprehending reading. Their behavior goes up. Their stress levels go down. I mean, the other thing that happens when you're hungry is your anxiety naturally rises. You become more aggressive and unsettled. So it leads to a lot of other behaviors that absolutely undermined the educational experience. RAZ: I mean, all these things are connected, right? Like, if you've got a kid who is eating a high fat and high sugar diet, that's what's feeding their brain, and that's what is going to feed their behavior. And then you've got a disruptive classroom, a teacher can't teach all the kids in the classroom. Like, it's all connected. KASS: Yes. And then it actually reverberates out even further. Then those kids get sick more frequently, which means they have to stay home, which means that their parents have to stay home from work, which has an impact on their performance at work and their productivity. And if we really focus our resources, the question is, like, if we have a few dollars to spend, what's the most impact we can have? There's not too many interventions that are going to give you, you know, 15 to 20 percent improvement on test scores with just a relatively small amount of increase in resources and focus around nutrition. We only see upside. We only see benefit from it. I've not seen any statistic that showed any kind of negative outcome here. RAZ: Sam Kass - he's a chef and the former senior food policy adviser at the White House under President Obama. You can see his entire talk at ted.com. Transcript provided by NPR, Copyright NPR.